Is 2012 turning out to be another 1980? After seeing and hearing the Democrats at their convention in Charlotte, it’s almost becoming eerie at this point. The sad truth for Democrats is that little has changed in 32 years. There’s an unmistakable feeling in politics that you get when you don’t feel quite right about your guy anymore; those feelings were rampant inside Madison Square Garden in 1980 and again at Time Warner Cable Arena this week. The feeling is palpable, and it sometimes signals pending doom. In August 1980 in New York City, incumbent President Jimmy Carter did not make the best speech at the convention. That moment belonged to Senator Ted Kennedy. Kennedy left the liberal delegates feeling nostalgic and believing that they nominated the wrong guy. As it turns out, they were probably right. In September 2012 in Charlotte, President Obama also did not make the best speech at the convention. That clearly belonged to former President Bill Clinton. Dollar Bill put on a spectacle that not only conjured up memories of better days for the Democrat faithful but also made the delegates wonder what might have been had Hillary Clinton prevailed in 2008 and she was the one being re-nominated instead. 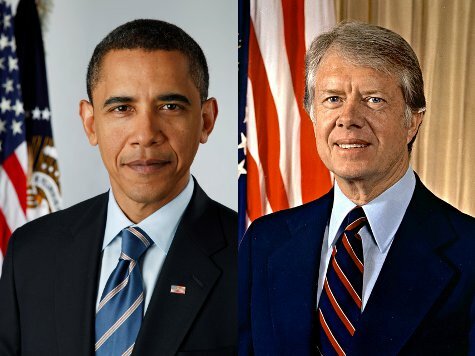 An analysis of the Carter and Obama convention speeches from 1980 and 2012 also shows striking similarities. Both men apologized for not living up to expectations. Both men acknowledged the tough state of economic affairs. Both men mocked and attacked tax cuts (big surprise!). Both men explained that governing is much harder than making promises. Both speeches were made in the long shadows of their idyllic campaigns of 1976 and 2008. Delegates in funny hats at both conventions sat wondering what went so horribly wrong in four short years and why they felt so differently the second time around. In 1980, the economic and political situation in America was abysmal, and the sitting president had no answers. In 2012, the economic and political situation is arguably worse. In fact, the current economy is so bad that the Democrats chose to offer abortion on demand during prime time speeches instead of economic solutions. Will this cynical argument put forward by the President and his team convince unemployed women to weather another four years of Obamanomics? Similarly, will Hispanic Americans be convinced to vote and be loyal to a party that wants nothing to do with God and has no answers for their struggling small businesses? And after all the mixed signals, should Jewish Americans trust that this President is on their side when it comes to Israel and our out of control national debt? Both Carter and Obama left their conventions with America in peril and their political futures very much in doubt. Americans had largely lost faith in both men and their abilities to turn things around. Their speeches for re-nomination inspired little to no confidence. The only thing left to decide is whether or not the Republican candidate can become a suitable alternative in the eyes of the swing voters in the swing states. We know how 1980 turned out – we’ll see if Mr. Romney can close as strong as Mr. Reagan.